Desensitization with allergy shots is usually recommended. However, allergy shots are expensive. What’s worse is they only work about 50% of the time! Other alternatives, such as steroids and antihistamines are becoming less and less popular, too; it appears they only make matters worse. Yes, allergy problems in horses are a nightmare! Allergies are becoming more and more prevalent. Yet hopefully, with the knowledge I am about to give you, you will never have to experience them with your horse! The obvious symptom of allergies is itching. This is often accompanied by hives, which are little raised bumps, similar to what a bee sting would make. In severe cases, hives are so numerous they gather together, causing what are called whelts. In extremely severe cases, the horse itches so bad it rubs and bites its skin until it is raw and/or bleeding! Horse owners feel helpless! Fly sprays, lotions, etc. help somewhat. Yet, for the most part, these simply make the owner feel better -- not necessarily their horse. The cause is not what the horses are exposed to! Flies, mosquitoes, and bug bites in general are “triggers” that make things worse, but they are NOT the cause of allergies. The cause is from “within”. Think about that for a moment. Why are some horses allergic to flies, hay, dust, etc. – items that are normal for them to be around? Why do horses today have problems when exposed to opossum manure (the source of the organism that causes EPM)? Horses have lived with opossums for millions of years! What has changed? Why are our horses more susceptible to illness such as allergies from flies, and West Nile from mosquitoes? Aren’t mosquitoes and flies normal insects for horses to be exposed to while in the wild? Today, unlike when I graduated from Vet School in 1980, just 25 years ago, things seem worse. Our horses appear to be weaker today as opposed to yesteryears? It is similar for humans. Can you imagine a Native American Indian stalking up on his prey, crawling through bushes full of pollen and all of a sudden, sneezing?! In man, allergies were never even heard of until the industrial revolution. In fact, the first mention of allergies was in highly polluted industrial areas of England. At first they were called Rose Fever, later simply allergies. Man and horse are worse today because we have bombarded them with so many vaccines, chemicals, pollutants and toxins. The consequence for man and beast, is an immune system that is critically out of balance. It simply is in “hyper” mode – not really knowing anymore to what it should react … so it simply starts reacting to everything – all those things you couldn’t possibly keep a horse away from! Another example of an over-reactive immune system is “Heaves”, or COPD (Chronic Obstructive Pulmonary Disease). Essentially this is an allergy in the lungs. Autoimmune diseases (where the body reacts to itself) are also related. 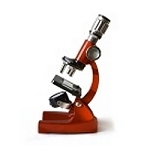 The bottom line is that the immune system is being overworked! What a mess we have! We have ruined our soils with salt fertilizers, over-vaccinated, over-medicated, over or incorrectly supplemented, and over-sugared so much, that a horse’s body does not know which way to turn. When was the last time YOU were vaccinated? Probably long ago! When was the last time you vaccinated your horse? Probably last week! For instance, vaccinations are often filled with preservatives like mercury and foreign protein. Ask yourself, “Are all of these vaccinations really needed year after year”? Let me assure you, everything, including vaccinations, has a consequence. If you have an allergy horse, please look at this issue carefully. Continually “sensitizing” with foreign tissue via vaccines, is a big part of the allergy syndrome. Copious vaccinations are not natural! The vaccines that your state requires are the only ones your horse should have. ***By the way, most will agree that allergies start in the spring. Nearly all horses are vaccinated every spring. Let me know if you see a relationship between allergies and vaccinations. I would appreciate the email! The best way to prevent or treat any disease, not just allergies, is to look at what the horse’s body is getting too much or not enough of! We have discussed vaccines and chemicals already. Vitamins, minerals and salt are equally important. Minerals are often full of heavy metals like aluminum and lead. Studies at the University of Kentucky show that Lead and Cadmium are often contaminants in minerals. Even salt is chemically made for other industries, not for horses. The horse’s body has to handle all of this extra “junk” in one way or other. I don’t know anyone who doesn’t try their very best to get their horses what they need. BUT it can be so confusing! What do you feed? What do you supplement? The list of questions goes on. Do you feel that you need a PhD in Nutrition? Are you considering going to vet school just so you will know how to take care of your horse’s needs properly? You don’t need either degree. Truly it is not that difficult! Keep in mind the basics… and leave the rest to Nature! For instance, horses, in general, don’t get enough fat, and get far too much sugar from sweet feed and corn. 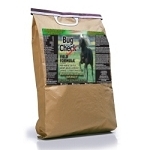 The essential fatty acids are a must in allergy horses. In order to deliver these, along with more fat, the best source, in my opinion, is coconut oil. We add crude, unrefined soybean oil to this to keep it liquid so you can pour it because coconut is a solid at room temperature. Also coconut oil is stable, and much less likely to go rancid, than flax or rice bran sources. Vegetable oil and corn oil are practically useless except for calories, of which most horses get way too much of, anyway. Basic #2: With allergy horses, especially, NEVER rely on complete feeds. 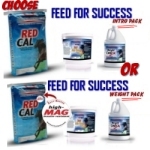 A “complete feed” or even oats alone simply can not provide what an allergy horse needs. For example, take two 1000 lb. horses - one horse that eats ten (10) pounds per day of a complete feed, or oats, - the other eats only 3 pounds. The later will get far less vitamins and minerals than the horse that eats 10 pounds per day- right? These “easy keepers” often get far less of what they need with regards to vitamins and minerals. This perpetuates the problem even more. The horses’ whole metabolism is adversely affected! They are stressed metabolically and they eventually wind up as insulin resistant, hypothyroid, laminitic, or cushinoid, and in some cases have such a messed up immune system they “develop” allergies – all because they were not getting enough vitamins or minerals. Personally, I don’t think there is such a thing as a complete feed! There are just too many variables. Each horse should be supplemented individually – especially the allergy horse! Our soils and foods grown on them, simply can’t provide a balanced diet today. Remember though, many minerals and vitamins however are man made. Even worse, many of them are another industry’s “left overs”. 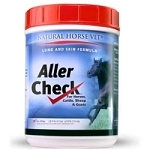 Basic # 3 All allergy horses must be supplemented with vitamins and minerals. Basic #4 Allergy horses need plenty of anti-oxidants. No doubt about it – anti-oxidants add years to ones’ life; but when severe allergy cases can be reversed with their use – that impresses me. For instance, my first experience with anti-oxidants in horses overwhelmed me. I had a patient with Heeves that was really about ready to die, and because I had seen tremendous beneficial lung changes in people from using grape seed in such cases, I decided to try it. I fed this horse $300 dollars worth of Grape Seed capsules in one month. I must have broken open 1000 capsules, but the horse improved – became well enough to go home! This showed me that anti-oxidants are a lot more than just a little vitamin A, C and E as so many products tout. Needless to say we used a lot more anti-oxidants in the future – in fact, today we have a specific antioxidant product for allergies - Much improved over our capsule experience! 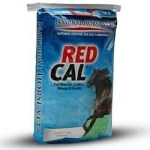 ALL of our horses, everyday, are supplemented with anti-oxidants. We want them around a long time. Finally, Basic # 5 Don’t short the salt. Horses are not lickers! THE major factor in allergies, or any illness of “unknown” cause, is the misuse of salt and mineral blocks. 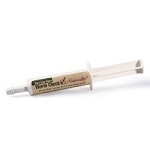 Free choice, natural sources of salt and minerals will help your horse’s allergies improve drastically. Horses are not lickers: they can’t get what they need from salt or mineral blocks quickly enough to get what they need! Horses need change whenever the barometer changes because the grasses that they eat have changed. The chemical composition of grass actually change with the weather. Also our “salt based” fertilizers used today often confuse the horse. The potassium contained within them literally tricks the horse into thinking he has plenty of salt already because the potassium ion is so similar to sodium. When this happens, they quit eating salt or if they only have access to blocks, they can’t even get as much of what they need. This situation is a major metabolic stress on the system. Many problems can result. The obvious ones are” tying up” and what we generally think are electrolyte problems. The least obvious, but the most dangerous, is the massive change in gut bacteria, which sometimes can be life threatening. Examples are laminitis, abortion, and allergies. Even free choice minerals can be a problem! That’s because man only has a vague idea of what our horses need. Every year new minerals and vitamins are being discovered – so how can we put them in a bag? When man makes a mineral mix, he is simply guessing. Even with a free choice mix that just has massive amounts of this and that, horses simply over-consume what they don’t need, while trying to get what they do need and quite honestly what they do need might not even be in the mix to begin with! I assure you; man-made blocks and mixes are missing critical elements! Many of the tiny micronutrients, or elements, like rubidium, molybdenum, palladium, cesium, and strontium, are critical for problems like allergies, COPD and even cancer. When I take away typical “man-made” salt and mineral blocks, and replace them with natural sources, many allergies and other problems go away! It is amazing what nature provides! I really hope you have stuck with me long enough to read this single point. 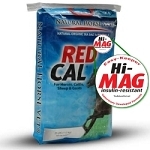 The most important thing you can do for your horse’s health is to provide a natural source of salt and minerals. Although we are still learning about allergies, a few things are very important. Certainly keeping flies and pests away is critical, but don’t overuse the chemicals or you could be adding fuel to the fire. The cause of an allergy must be addressed, rather than just treating the symptoms. Nutrition is critical. Vitamins, minerals, anti-oxidants, and essential fatty acids should not be overlooked as part of the treatment. Less sugar in the diet is always best. Feeding oats rather than “complete” feed, supplemented with NATURAL sources of vitamins and minerals – top dressed and based on the needs of each individual horse is also best. And instead of salt and mineral blocks, natural “free choice” supplements are better and may even contain beneficial ingredients we don’t even know about yet. Finally, in my humble opinion, you should only vaccinate for what you absolutely think is necessary. If we provide the body what it needs, it will heal itself!